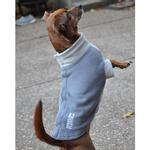 Keep your pup cozy with our new Highline Fleece Dog Coat in Two-Tone Gray by Doggie Design. The new step-in Highline Fleece coats are simply perfect and perfectly simple. Designed with ease in mind for both human and canine alike, after slipping the front paws through the coat, attach the touch fastener tabs at the top and you’re ready for the park. 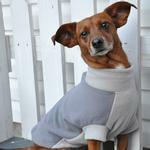 Made from a thick 280-gram fleece, these coats will keep every pup comfy and warm this fall and winter season. The touch fastener tab design across the back makes it easy to adjust fit and attach a leash to a Doggie Design harness underneath. The Highline Fleece coats are available in 6 color combinations to choose from and come in sizes that fit every breed from 3 to 150 pounds! For broad-chested breeds, look for the "BC" designation on the size chart. Highline Fleece Dog Coat by Doggie Design - Two Tone Gray Customer Photos - Send us your photo! Peach is exploring and so comfy in the cold weather with her Highline Fleece. Hercules is my wild and wacky Pit mix, brindle grand-puppy. He looks extra cute and cozy in his Highline Fleece! Posted On 01/16/19 by Kelley F from Iowa City, IA Yes, Kelley F recommends this product! I got this in a size 10 for my cousins Chinese Crested/Chihuahua mix. To check the sizing, I tried it on our chihuahua. He is 8 1/2lbs and has a 15" chest and this fit great. I had to click on other colors because the size chart isn't shown on this fleece listing. This is the 7th fleece jacket in this style I have bought. My dogs love the comfy warmth. I love the convenience of the velcro on the back. There is an opening between the velcro to hook your leash. AND it has a high cut tummy so my boys don't soil them when they go. BEST DOG FLEECE EVER!! This is the 7th fleece jacket I have bought. My dogs love the cozy warmth. I love the cut, so there are no accidents when they go out. The sizing is perfectly accurate. The leash fits nicely between the Velcro closures. It is my dog's and my favorite jacket. Posted On 11/25/18 by Kylie L from Chino Valley, AZ Yes, Kylie L recommends this product! These sweaters come in so many sizes and they are very cheap, great 'around the house' sweater for my pup. I got size 16 for a 25 lb. Rat Terrier/Basenji mix and he has plenty of room to pee. Fit is snug but not tight, super easy on/off and stays in place. Posted On 11/22/18 by Sabine A from Woodbridge, VA Yes, Sabine A recommends this product! It is very nice and soft. My dog loves it! I love it! Posted On 11/07/18 by Sonya S from Catawba, NC Yes, Sonya S recommends this product! This fleece coat was adorable, but a little too snug in the size I ordered. I wanted to use it as pjs. Posted On 03/02/18 by Laura B from La Mesa, CA Yes, Laura B recommends this product! I ordered this for our 55-pound boxer mix, who has a much thinner coat than our lab/husky. It fits perfectly and she likes wearing it. This is the first coat we've had that closes on top on the back, but it works. The gray looks great on our brindle dog too! Posted On 02/05/18 by Cindy L from , IL Yes, Cindy L recommends this product! Benny loves his jacket! I ordered 2 in different colors. They are very true to size and are really sturdy. Benny had front leg amputation surgery 2 weeks ago, so this jacket is perfect to put on him! It closes down the spine instead of under the belly. I had to do an alteration to remove the left front leg so he wouldn't get a draft up there or be able to lick his incision. It's very soft and doesn't rub on his incision. It also keeps him warm while his fur is growing back. Posted On 01/11/18 by Kelly V from Saratoga Springs, NY Yes, Kelly V recommends this product! 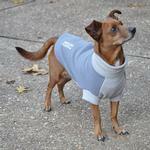 Love these cozy Fleece dog coats - keeps my babies warm! Posted On 01/07/18 by Mounie from Wilmington, MA Yes, Mounie recommends this product! My girls will wear these all day. I like that they close on their backs. Posted On 12/16/17 by Kelley M from Olympia, WA Yes, Kelley M recommends this product! Just purchased this sweater for my grandpuppy. He is a medium sized Pit Mix with short hair. This fleece “jacket”/sweater is warm, well-made and affordable. Most importantly, it will keep him nice and toasty in the damp, cold PNW winter! Just rec'd sweater & already needed to wear it ! Luv the fit... covers belly and high on neck to keep cold air at bay... glad I ordered 2 for my boy! Posted On 11/17/17 by Vicki W from Smithtown , NY Yes, Vicki W recommends this product! This coat is perfect for my little old man. Easy to put on and fits great! This product fits my dogs very well. I like that it protects their bellies from the wet and cold as well as being overall warm. They are easy to put on and take off too.